A little over three years ago, Aldo Amenta broke his neck and became paralyzed. He didn't know if he would graduate from college — let alone walk at the ceremony. On Sunday, he did both. Amenta walked across the stage to accept his diploma at the Florida International University (FIU) graduation ceremony. 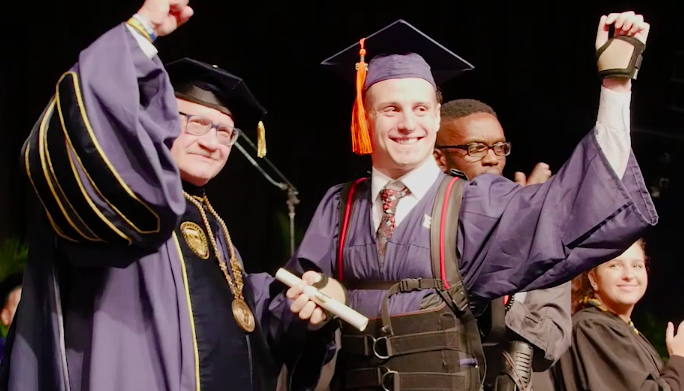 The new graduate, who normally uses a wheelchair, was able to take part in the ceremony thanks to extra support from an exoskeleton, he told CBS News, adding that he's been training with it for "about 6 months to a year." "I have so many mixed feelings ... overwhelmed, happy, grateful," said Amenta, a Venezuelan native. "I feel so blessed to have been able to accomplish that milestone." "When you find yourself in situations like this, you start thinking a lot of negative things … that there's no hope or no way out," he said. "We were struggling to be able to afford the medical expenses or go to rehab or study. We chose to stay with the health situation, to go to therapy and work on that," Amenta told CBS News. "But since I wasn't enrolled in classes, my legal status under the student visa was being compromised." "That motivated me a lot," Amenta recalled. "You don't know the joy it gave me to have their support. From there, I went back to school and basically got my life back on track again." The young man is applying to the electrical engineering master's program at FIU and hopes to walk on his own again one day. Despite all Amenta has been through, he said he is "grateful" for the support he has received. To others who experience a similar trauma, he said, "You have to keep hope, faith, have perseverance and a lot of patience towards that particular situation." "Even if you find yourself in a really dark place, there's always a little light that will shine your way through to succeed. So, just follow that."